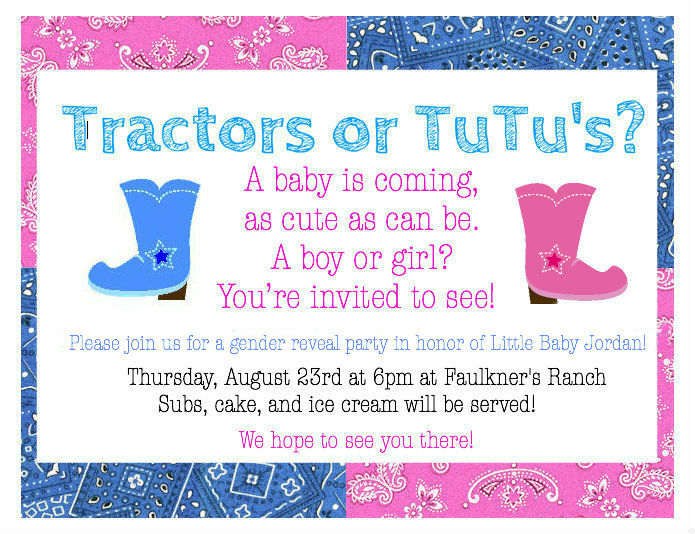 Have you heard about the latest trend of gender reveal parties? 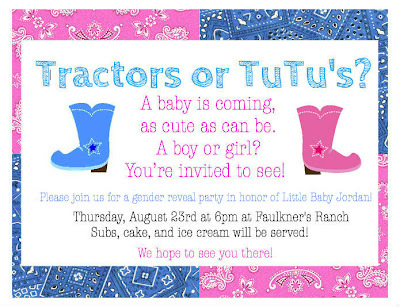 A gender reveal party is a modern way to savor the surprise of finding out if your baby is going to be a little cowboy or cowgirl and share that moment with your loved ones. We just love the idea! So of course, when Kelly Jo, our niece/cousin/social media director asked us if her and her husband Ben could host their party at the Ranch we said yes! Check out all of the details of this fun event below! My family is in the business of throwing parties. So, of course, when the opportunity arises to get everyone together and celebrate, I'm on it. We knew from the moment we found out that we were having a baby that we were going to find out if we were having a boy or girl. I have love the trend of gender reveal parties and the idea of sharing that happy moment with our family was something I knew I couldn't pass up. 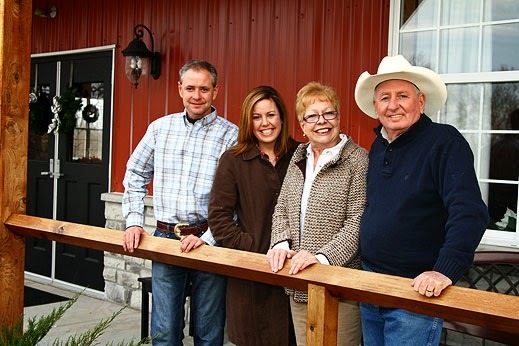 So, last Thursday, around twenty-five of our family members gathered at Faulkner's Ranch for the big reveal. Of course, since it was at the Ranch, I just had to go with a western theme! Since we wanted everyone to be able to sit, talk, and enjoy a tasty meal before we cut the cake, we served deli subs, veggies, and chips. We carried on with the pink and blue theme in the drinks too. We tallied the votes on the chalkboard, which I made out of an old cabinet door that I got from Habitat ReStore for $2 and some chalkboard paint. After everyone voted, they could show off their team colors (pink or blue) with a bandana. I was thinking that no one would want to wear the bandanas, but boy was I wrong! We actually ran out of the blue ones! Finally it was time for the big moment. We had ordered a cake from Dillons, believe it or not. 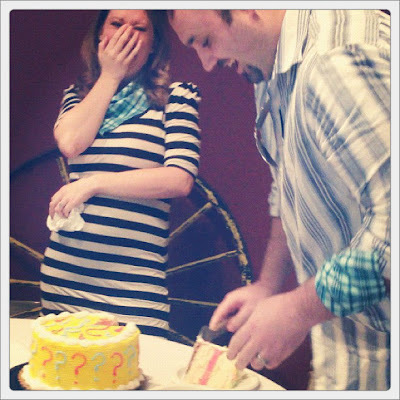 The young guy I gave the envelope to had never heard of a gender reveal cake but they did an awesome job with it! Anyway, we were TOTALLY shocked! We were both certain that it was a boy. I think it actually took the whole night for it to sink in with Ben. He just kept looking at me saying, "We're having a little girl" as if he didn't believe it. Speaking of those blue bandanas, we were cracking up because after the cake was cut we kept finding blue bandanas on the tables and the floor. No one wanted to support the losing team's colors. 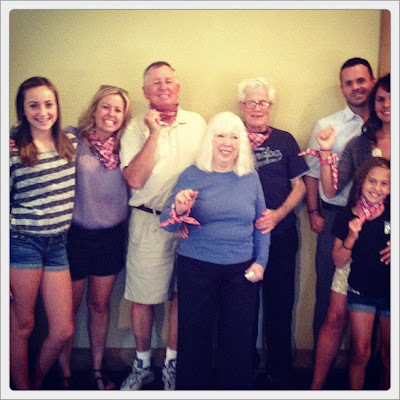 Look at Uncle Bob and Christine just showing off! Anyway, it truly was a fantastic night! I just kept thinking about how this little baby, who isn't even here yet, is already so so loved. Thanks Uncle Bob and Christine for letting us have the big reveal at our favorite place! That was so so much fun Kelly Jo and Ben!